Ed and I drove up to Chute Lake yesterday to do some cross country skiing. Chute Lake is approximately 20 miles north of Penticton via the Naramata Road which sits at an elevation of almost 4,000 feet above sea level. So, while the valley folk below were already running around in shorts on this balmy Sunday in February, there was still snow up at the Lake… and lots of it. As such, we were looking forward to a nice ski along the KVR (old Kettle Valley Railway) / Trans Canada trails. Unfortunately, the snow machine drivers had chewed up every possible inch of trail – making the snow so uneven that it was rough going on skis – not to mention that it ate through the ski wax in no time flat. So, rather than give up in frustration, and seeing that there were 5 guys ice fishing from their snow machines on the the lake, we figured that the ice would be safe enough for a couple of skiers. Shortly after venturing out, I confirmed that the ice was at least a foot thick, which I determined when I stuck my pole down one of the ice fishing holes. After skiing for 2.5 hours, we went into the Chute Lake Resort for a cup of hot chocolate. The Lodge is a very rustic affair that we love to visit, especially to peruse the historic artifacts that are located throughout the building. 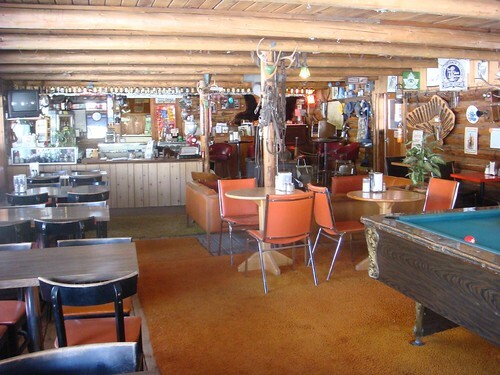 Here’s a picture of the Chute Lake Lodge dining room’s interior, and another from the inside looking out in which you can see a number of antique irons on the window sill. If you ever get up that way, give Chloe, the fat old Labrador that inhabits the couch outside the Lodge entrance a pat from me. She’s a doll. To see Chute Lake’s location near Okanagan Mountain Provincial Park on a map, go to Google Maps . You may have to zoom out to see its location in relation to Penticton and Naramata. You are an inspiration. I cannot imagine cross country skiing on unbroken snow let alone all of the other trials you faced! And then to actually be looking forward to biking as well? I am completely overwhelmed at the thought. Although that probably has a lot to do with how overweight I am. LOL SOOO like I said… you’re an inspiration. Not only do I now have my first website up and running (still adding content but at least it’s live) which I could NEVER have done without The Super Affiliate Handbook but I also have some new fitness goals to look forward to as well. 🙂 So… thanks again for showing me how amazing life can be if you just step outside of your comfort zone and LIVE!!! In fact… I might just blog about you on my site if that’s ok?? Thanks for leading the way. Hi Nikki! Actually, breaking trails is my favorite way to cross country ski and I do love the workout — well, maybe not the first 10 or 20 minutes of it, but after that it just feels great. So, you’re absolutely right… you have to get outside your comfort zone first, but after that, it’s nothing but fun!